Published in the South Kent Gazette, 17 September, 1980. On the land side the castle retains its medieval aspect, although parts of it, during the American and French wars from 1784 to 1815, were altered for the purpose of defence. On the northern salient, extensive fortifications were constructed in the 18th century, and those remain, although not armed. At the same period, the top of the Keep was arched over, and a gun mounted thereon to command the north-east, the most vulnerable side of the fortress. All the old provisions for defence are now out of use and later armaments have been confined to the outskirts of the seaward face of the castle. About the time of the Franco-German war of 1870, six heavy muzzle-loading guns of that period were mounted on the western face, and two on the eastern. These were later replaced by breach-loading guns. Under the castle cliff an outwork, called the Moat Bulwark, was built in the reign of Henry VIII and this was used at the time of the Spanish Armada, in connection with a moat which extended from the cliff bulwark, along the shore, down to a fort called the Three Gun Battery, at the top of Snargate Street. 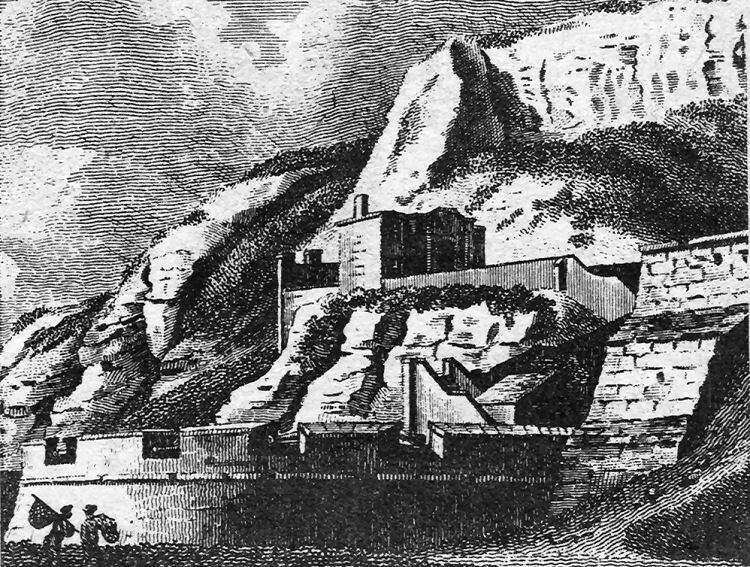 In 1796 a shaft of steps from the top of the cliff to the Moat Battery was made and it is recorded that the Prince of Wales, afterwards King George IV, descended them in 1798. The Moat Bulwark remains, and some traces of the moat may be seen at the back of Liverpool Street; but the Three Gun Battery was dismantled in 1764; and a more advanced line of defence formed, in 1784, by Sir Thomas Hyde Page, on the shore, consisting of four forts, being Guilford Battery, in front of the castle; North’s Battery, in front of New Bridge; Amherst Battery, opposite the tidal harbour; and Townsend Battery, where the South-Eastern Railway station stood; forming a chain of effective works, which were placed in charge of the castle guard, but which were, in times danger, manned by the Volunteers of the Dover Association formed by the engineer who constructed the works. After Guilford Battery became redundant the site was used by the Army for sometime as the headquarters of the South East District. On part of the site the Buffs had their Territorial Drill Hall which was originally built, in 1913-14 as a roller stating rink. During the war it became a seaplane shed and later reverted to use as a drill hall. There was also the old Artillery Drill Hall close by with access from Liverpool Street. This was built for the Cinque Ports Artillery Volunteers who were formed in 1859. A riding school, costing £5,767, was added In 1912. North of the Castle was built, in 1861, a powerful outlying work, which was at first called Fort George, and subsequently, Foil Burgoyne, after the General who suggested its construction. It was, about the year 1872, mounted with six screw Armstrong breach-loading gums; and there were, at the same time, connected with this work, two wing redoubts, the one facing seaward and the other commanding the Dour valley, but they were not armed. The guns have now been removed, as the work is open to the fire of modern long range guns from higher ground. Between this fort and the Castle a series of wooden barrack rooms known as the Red Huts was built with improved quarters for the Royal Artillery. The fortifications of the Western Heights date from the year 1780. They then consisted only of field works, which, about the year 1803, were partly converted into permanent fortifications. The Citadel, at that period, occupied the western portion of the position, the eastern end being taken up by a small fort called the Drop Redoubt. To the north, these works were, in the early part of the 19th century, partly connected toy lines, which were left in an unfinished state. On the south front, the Citadel was connected with the shore by a line, which was, at that time, left incomplete, behind the left flank of which was the old work known as Archcliffe Fort, which was only regarded as being useful as a sea battery. The Western Heights are 1100 yards from the Castle, and it was considered by the Commission for the Defences of the United Kingdom, of 1858, that it would be an improvement to the defences of Dover if a line of ditch and rampart were constructed to connect the Western Heights with the Castle, on the land side, but, owing to the large amount of house property that would have to be purchased, they could not recommend it; but they suggested that plans for connecting lines might be prepared, and left for execution to a time of expected attack. The idea soon became out of date, and was not carried out. 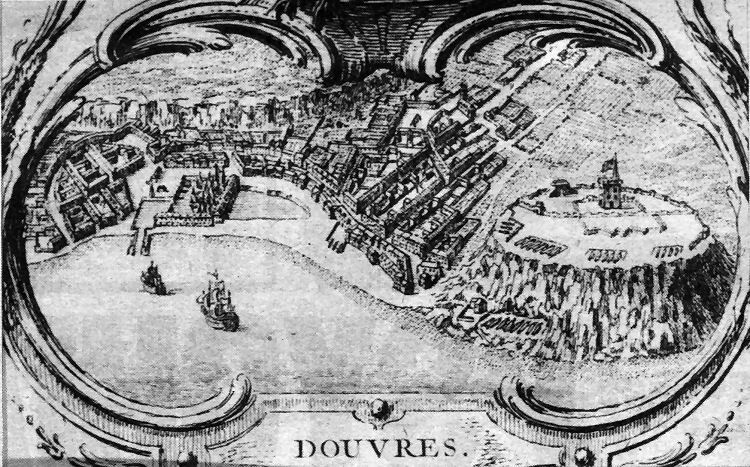 The works which were carried out at the Western Heights, by the recommendation of the Defences Commission, were: (1) The formation of the ground between the Drop Redoubt and the Citadel; (2) the completion of the south lines, including an earthwork called the North Centre Bastion and the Northern entrance; (3) the provision of caponnieres to flank the ditches of the Drop Redoubt, and a counter-scarp to that work, and a connection with the adjacent cliff by a rampart and ditch; (4) the formation of an earthwork to strengthen the west front of the Citadel, the scarping of the south side of the Heights, and completing the line connecting the Citadel with the sea; (5) providing casemate quarters. powder magazines, and store rooms in the Citadel. The whole of these works were estimated to cost £149,000, but the actual expenditure amounted to £283,017, distributed amongst the various sections of the work as follows; The Drop Redoubt, £35,557; the Citadel, £54,540; the South Front, £54,520; the Western Outworks, £86,143; and the North Centre Bastion, £52,257. By 1859 this expenditure had transformed the Western Heights into one of the mast elaborate pieces of fortification in the United Kingdom. But within 50 years modern methods of warfare and weaponry were such was limited; but after the completion of building in 1900s. Being commanded by higher ground modem long range artillery could fire into them and they were not built to withstand the high power of modem explosives. The landward works were not armed, although this would have been quite easily remedied had the need arisen. But the range of early 20th century artillery, if Dover had to be defended from the landward side, would have made it necessary for the defensive ring to be pushed out to high ground, which, at long range, commands the Western Heights and the site of Fort Burgoyne. The Western Heights were mainly used as the quarters of infantry battalions of the Dover garrison for more than a hundred years. From 1803 until 1815, militia regiments from various parts of England were quartered there, some doing garrison duty, and others completing their training preparatory to being sent to the seat of war. The largest number of troops ever encamped there was at the close of the Crimean war in 1856, when the 41st, 42nd, 44th, 49th, 79th, and 93rd Regiments were there under canvas. At that time, the accommodation of the Citadel. It was armed with three 9in breech-load-1859 there were three sets of barracks, the Grand Shaft, the South Front and the Citadel. The regular use of the South Front barracks was abandoned when provision for two battalions was made near the Castle by the building of Connaught Barracks in 1912 and more accommodation, at the Castle itself, in the 1920s. The only part of the Western Heights that in the old days was not devoted to infantry was the Drop Redoubt, which accommodated a considerable number of artillerymen, who formed the staff of the Record Office of the Royal Garrison Artillery. The strongly fortified Dover as visualised by the French in the middle of the 19th century, Note the range of guns on the Castle slopes, in the Guilford Battery at the foot of the cliffs and North’s Battery in the centre of the picture which is supposed to be in front of New Bridge. Above is an engraving by S. Sparrow, dated June 2, 1772, of Moat Bulwark below the Castle.